LOUDON, N.H. – At New Hampshire Motor Speedway the past few years, fans have come to expect the unexpected in victory lane for Sprint Cup Series events. Eleven different drivers have gone to victory lane in the past 11 Sprint Cup Series events at the track. 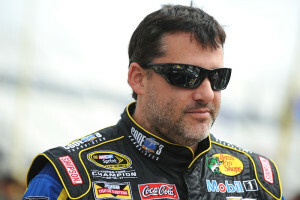 Tony Stewart is hoping to become the first repeat winner in the past seven years in the 5-Hour Energy 301 on Sunday. And should he accomplish that feat, he would keep alive the streak of expecting the unexpected. Since 1999, seeing Stewart in victory lane at a NASCAR Sprint Cup Series event could hardly be considered a surprise. But for Stewart circa 2015, a win Sunday in Loudon would definitely stand as shocker. Stewart, a three-time Sprint Cup Series champion, arrives in Loudon in the midst of the worst season of his NASCAR career. In 18 races this year Stewart has no top-five finishes, one top-10, sits 28th in the series standings and in danger of failing to qualify for the Chase for the Championship 10-race NASCAR playoff. Sixteen drivers qualify for the Chase for the Championship, with a victory locking a driver in. The rest of the field for the Chase beyond winning drivers is set by series standings. “I feel like every weekend, it’s the weekend we’re going to find it,” Stewart said. “It’s disheartening, takes the wind out of your sails when you realize you haven’t found it that week. Stewart, 44, won at least one series event every year from 1999 to 2013. He missed the second of the 2013 season after sustaining a broken leg in an accident racing a dirt Sprint car. He missed three events in 2014 in the aftermath of an accident he was involved in at Canandaigua (N.Y.) Motorsports Park in Aug. 9 that killed driver Kevin Ward Jr. The 2014 season was Stewart’s first in the Sprint Cup Series without a victory. Two factors help to keep Stewart’s optimism alive: The Chase qualifying format means a single win could qualify Stewart for the championship field. And in 2011 Stewart seemed lost for much of the season, but earned one of the final spots in thee Chase and ended up turning around his season and rolling to his third series title. Part of that vault to the title came when Stewart won the second race in the Chase for the Championship in 2011, which came at New Hampshire Motor Speedway. Based on history, Stewart knows that season-changing day could easily come in Loudon. In 31 career Sprint Cup Series starts at New Hampshire, Stewart has three victories and 14 top-five finishes. Tony Stewart has become the Tiger Woods of NASCAR. Hey That’s just cold ! Tony Stewart’s 28th place finish at Indy again shows how he has become the Tiger Woods of NASCAR.